← mr mildbyte, I presume? At the beginning of Morrowind, you're a chump who just got off a prison ship with 87 gold pieces (one loaf of bread costs 1 gold piece in this world, so that's conveniently about £35 - that's how much you would pay for 87 packs of Tesco Everyday Value Sliced White Bread). Your first assignment is to take a parcel to a guy in a different city, and you either have to take the silt strider (a massive insect with long legs piloted by a possibly drunk creepy guy, not unlike London buses) or walk there through the wilderness, fighting off hordes of oversized carnivorous birds with the iron dagger you had just stolen from the Census office, except the dagger always misses because, see, Morrowind's combat system is inspired by tabletop roleplaying games and they didn't pay their animators that much, so even if your weapon clearly appears to hit the mushy body of whatever it is you, the player, are aiming at, there's no guarantee at all that you have actually hit. So after ruining a couple of mice with repetitive rage-filled clicks, you decide to quit Morrowind and do something better with your life. Or you keep going and learn about how fatigue affects your chances to hit everything (and on everything), read up on game mechanics, buy a new mouse, make your way to Balmora and get immersed in one of the richest worlds I've ever seen in gaming. You go through a story that raises questions about organized religion, xenophobia, colonialism, tribal legends, prophecies, free will and the priorities of an individual versus the organization that they belong to. And somewhere during that process of discovery, you realise that the swings with your crappy dagger don't miss anymore. In fact, your dagger is no longer crappy. In fact, you don't even use a dagger, instead having found an amazing sword in a dungeon guarded by a couple of possibly too sexualized and extremely dangerous monsters. You decide to murder a God and capture his soul because it has the biggest enchantment capacity. When you need to get somewhere, instead of a long slog through the wasteland you use one amulet to teleport to the nearest Temple, bunny-hop (because that makes you move faster) or levitate your way through whatever town you ended up at, enter the Mages' Guild, use the Guild Teleport, use another amulet and finally fly to your destination. You murder entire cities in drug-fueled rampages just to please yourself and then reload the last save. You pilfer the treasuries of great Houses and steal rare armor and weapons, just to go to a remote island and sell them to someone who just happens to be a massive crab - you say it's because he gives you the best prices, but it's actually because everybody else is scared of you. Taking the silt strider (or the boat) - but note you can't immediately get to your target town and might have to change through one of those bad parts of town. Takes in-game time, but we'll say it's instantaneous as perceived by the player. Guild of Mages Teleport - instantaneous as well. You have to talk to mages, but they are a nice bunch, really. Divine/Almsivi Intervention - this is where it gets interesting. Divine Intervention teleports you to the nearest Imperial fort (Morrowind is part of the Empire and is still quite reluctant about that idea) and Almsivi Intervention teleports you to the nearest Tribunal Temple (which is the official religion of Morrowind that was around way before the Empire). Mark/Recall - two spells, one places a mark and the other one teleports you to that mark. Propylon Indices - long ago, someone decided to build lots of cool-looking strongholds in a circle around the island. Good news: there's a teleport chamber linking them in a round-robin fashion. Bad news: you need a Propylon Mark for each one of those strongholds to use their teleport and those are often tough to find. Also, these strongholds have been overrun by various nasties and generally aren't pleasant to be around. I'll exclude them from my analysis for now. There are minor delays on the Circle Line due to sharks (from http://www.terminally-incoherent.com). So you can see how some interesting ways to get to places can arise by combining these means. For example, you could totally cast Almsivi Intervention to get teleported to the nearest Temple, then Divine Intervention to get teleported to an Imperial Fort, then use a Guild teleport and immediately cast another Almsivi to get to yet another town. 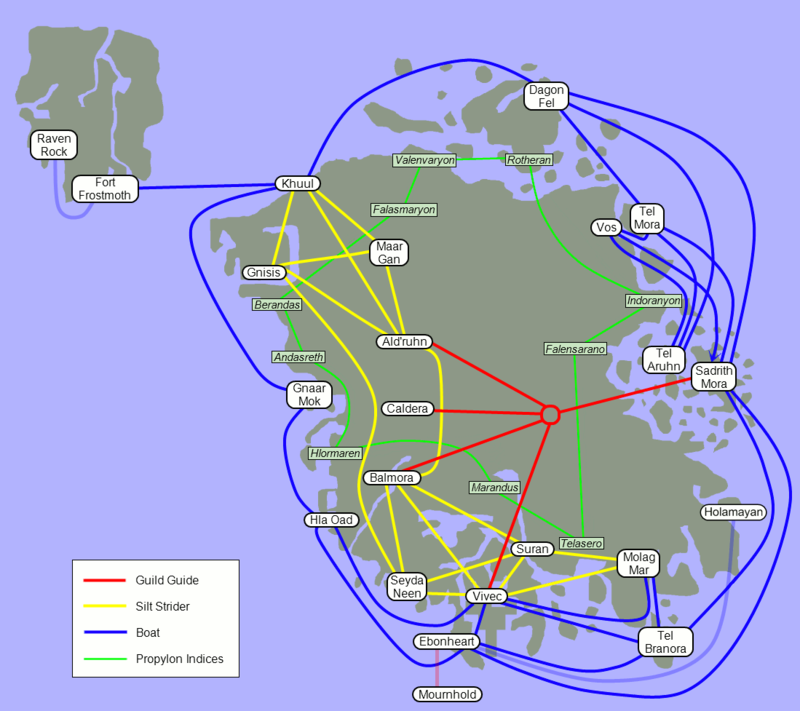 But of course it would be boring if I just spent some time reading those Morrowind travel maps, making a graph and running Dijkstra on it. For one, that wouldn't make for a good blog post. In addition, it doesn't help you if you end up somewhere in the wilderness (see that area in the middle, circled by Falasmaryon, Valenvaryon, Rotheran, Indoranyon, Falensarano, Ald'Ruhn and Maar Gan? Yeah, don't go there). Finally, there are quite a few large fan-made add-ons to Morrowind, including Tamriel Rebuilt, because, see, I've been lying to you and that island isn't called Morrowind, it's actually Vvardenfell and Morrowind is the province Vvardenfell is part of. Tamriel Rebuilt tries to recreate this whole province (yes, the whole Morrowind isn't in the game called Morrowind. What's more, Tamriel is the whole Empire of which Morrowind is a part and, yes, Tamriel Rebuilt just tries to recreate Morrowind in-game. In the game called Morrowind). All of this was me trying to convince you that it's a good idea to find a systematic way to scrape this data out of game files to make our lives easier. And imagine the kinds of things we'll learn if we do that! Demographics! Population heatmaps! Graphs! We might even plot property prices and travel times! Next time on project Morrowind, we will battle with confusing binary formats, bizarre conventions, linear algebra, Python and will possibly learn more about the lore of Morrowind and its game mechanics. Stay tuned!